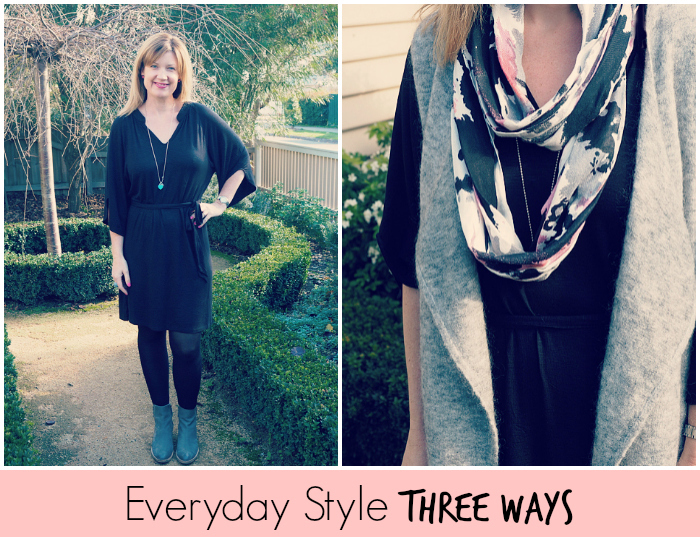 If you’ve been reading this blog for a while you’ll know that two of the regular fashion posts around here are Everyday Style @ Shenanigans Central, which features a particular in season outfit I’ve worn, and Styled Three Ways which takes one item and, yep, you guessed it, I style it three ways. Today’s post is a bit of a mash up of both. 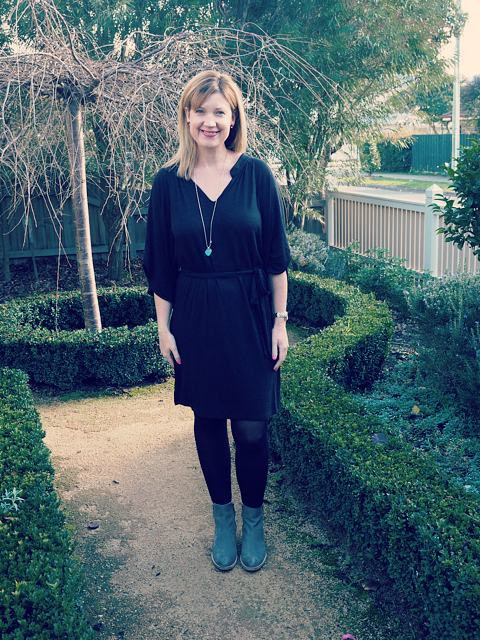 I’m featuring an outfit I wore to my son’s birthday party on the weekend and also showing how this versatile Black Slub V-neck dress*, RRP$79.95, from Blue Bungalow is by showing it with different layers. Here in Melbs, I need all three layers as it’s been very cold indeed of late (the day I wore mine, it was the coldest morning in Melbourne since last August!) however, you might find that one of the three looks below best suits your climate or occasion right now. This dress would also be a great piece to take on holiday if you’re looking for some easy wearing, trans-seasonal options now. Here’s the bottom layer or the dress au naturale on me. It’s very much an everyday piece for me but one that can be styled in a number of different ways across seasons, given it’s medium weight cotton fabric. I couldn’t wear it on it’s own like this on a standard Melbourne Winter day but this would be ideal for warmer climates further north. 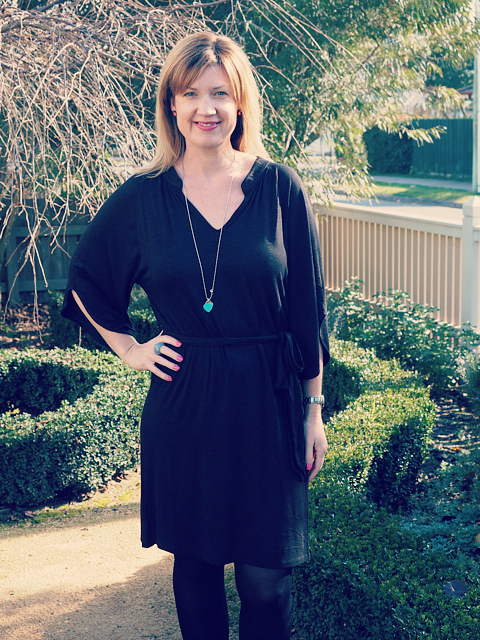 I’ve paired my Black Slub V-neck dress with a pair of tights, Country Road Sabina boots in grey from earlier this season (the grey is sold out but this style is still available in black), my Tiffany & Co. pendant, a pair of Mimco studs (from last Winter) and a resin ring from a market. 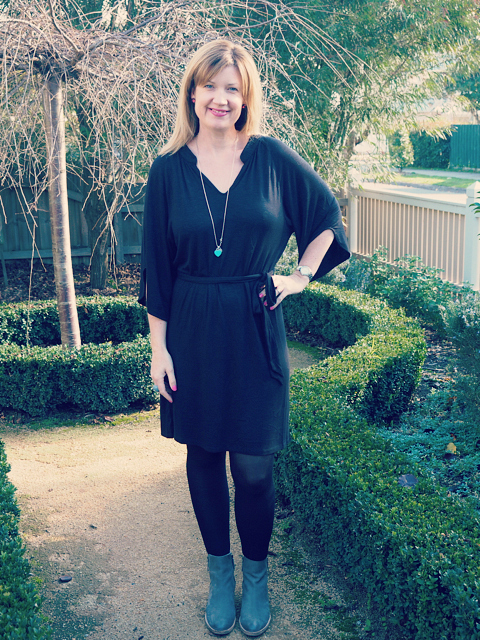 (I’m getting loads of wear from these flat ankle boots – they are comfortable and have been a great every day basic for me this Winter. I bought the black suede version last year and they’ve been worn well too). You can see that this dress is a loose, cotton slub with a tie waist which draws in to create some shape. While you’d normally associate a slub texture with a more casual look, this dress is much more than a t-shirt dress. The smart V neckline and the flattering sleeves, both with small but interesting details, elevate this otherwise casual dress into more versatile territory. Size wise, it’s on the generous side. I’m wearing a Medium and, as you can see, I’ve got plenty of room for this dress to skim and drape nicely once tied in without clinging. Loving that. To give you an idea of it’s length, I’m 175cm/5’9″ and it hits me a good inch and a half above the knee but on the model, who is 161cm (she is wearing a size small), it’s more mid knee length. 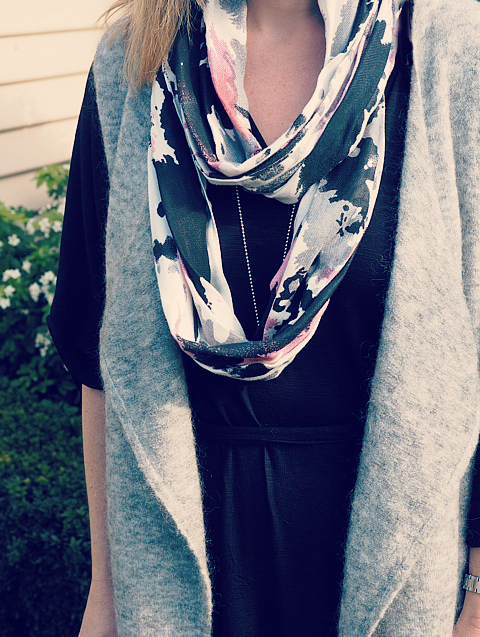 Below, I’ve added a printed infinity scarf, or snood, as I like to say. With it’s abstract print featuring splashes of black, grey, pink and orange, this Decjuba scarf was add to cart at first sight. It goes with 3/4 of my Winter wardrobe and is a nice lightweight pop of colour when you don’t need the warmth of a woollen scarf. It picks up the grey of my boots too and together, they make a nice, relaxed everyday outfit. Unfortunately, even though this is a recent purchase, this scarf is not available online. Head into your local Decjuba store though as you might have better luck there. 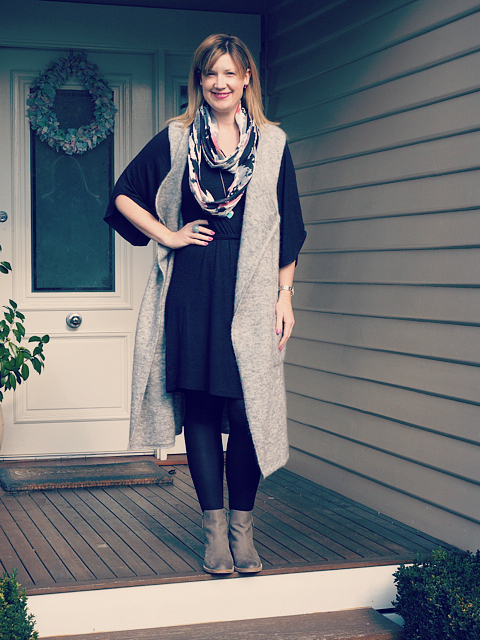 Finally, I’ve added my longline gilett, picked up at Witchery’s Autumn/Winter launch back in February. 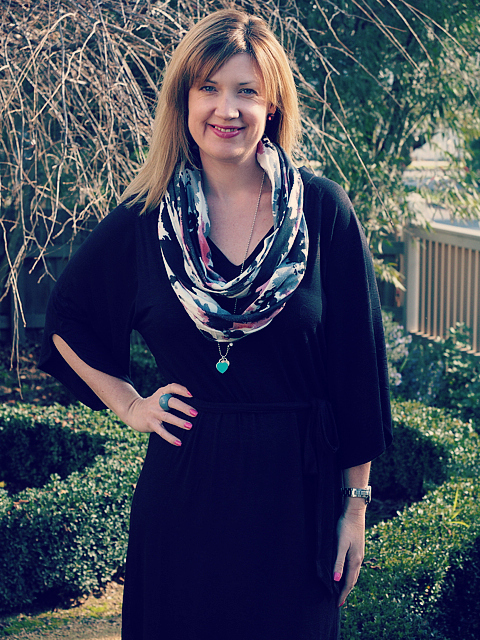 This is such a great layering piece and goes over pretty much anything – jeans, pants, dresses and skirts. Again, the grey picks up the other grey touches too. * This dress was kindly gifted to me by Blue Bungalow. For more information, check out my Disclosure Policy here. So how would you style this dress? What’s been your everyday winner this Winter? Where’s your favourite scarf from?